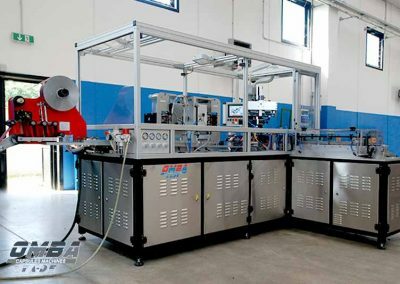 Our wine capsule machines is equipped with a solid chassis designed to minimize vibrations and increase resistance to mechanical stress. The upper guard is made of aluminium profiles and sliding and folding polycarbonate doors, equipped with safety microswitches. 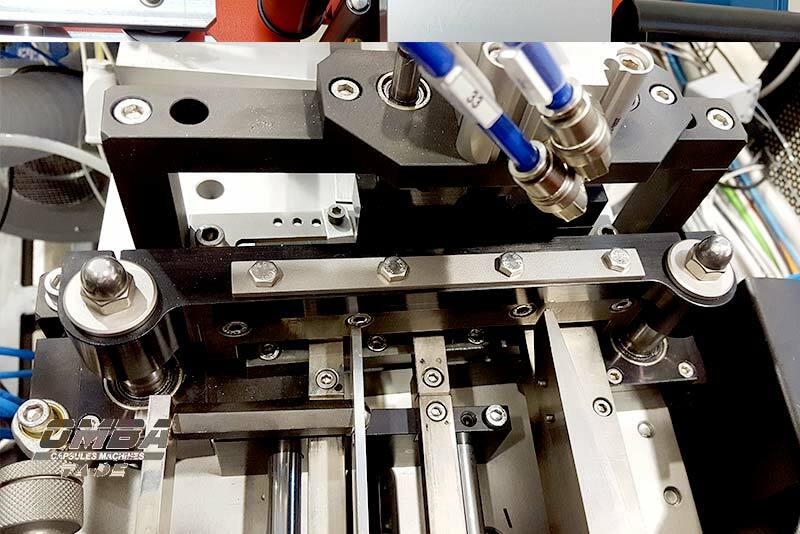 The chassis with adjustable feet is provided with stainless steel doors equipped with microswitches. 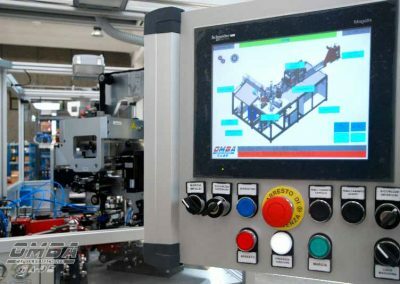 The work phases are regulated by a microprocessor which monitors all the phases. All the drives are controlled by a Touch Screen panel, displaying machine operating data and information on emergencies or problems. The capsules produced are widely used as decorative and protective cover for wine bottles or in other applications where coverage is required. 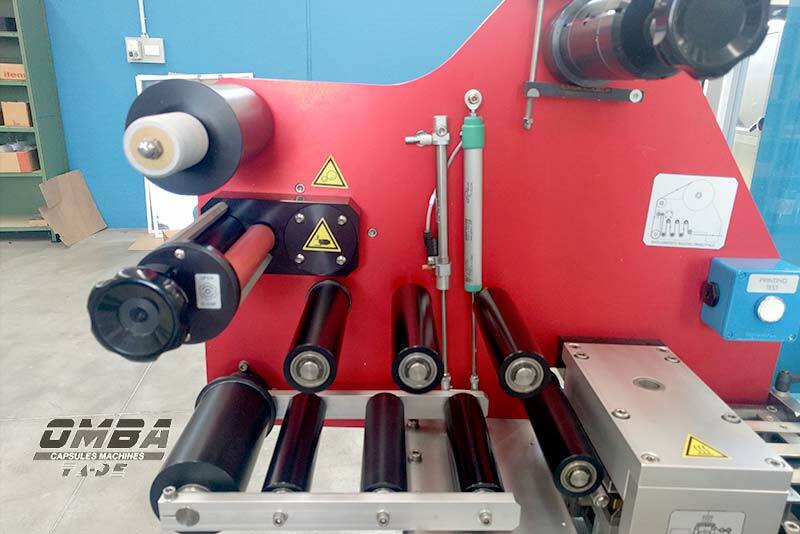 Our wine capsule machine produces in particular oenological capsules, pvc capsules, aluminum capsules, capsule bottles, heat shrink capsules. The heat-shrinkable capsules, made of PVC, are the most widespread security seal whose application is widely used and very versatile. The heat-shrinkable capsules produced by our wine capsule machines can be applied as a corkscrew on both bottles with cork closure. 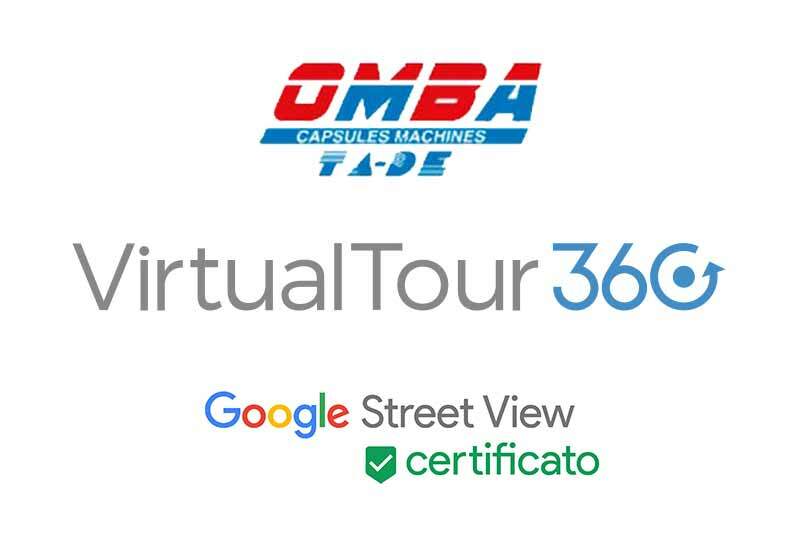 Omba TA-DE builds high-performance wine capsule machines, Enological Capsule machines with a production of 120 capsules per minute. 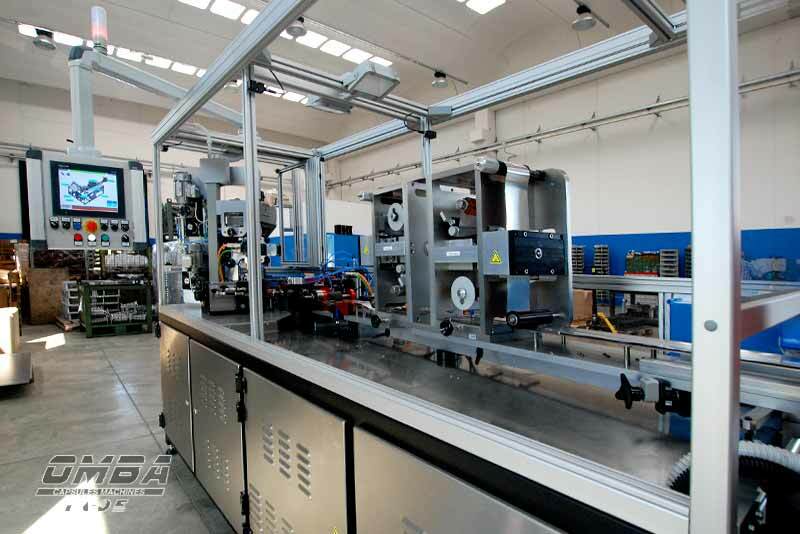 Production of pvc capsules, aluminum capsules and polylaminate capsules. The best wine capsule machines with high quality and safety standards. 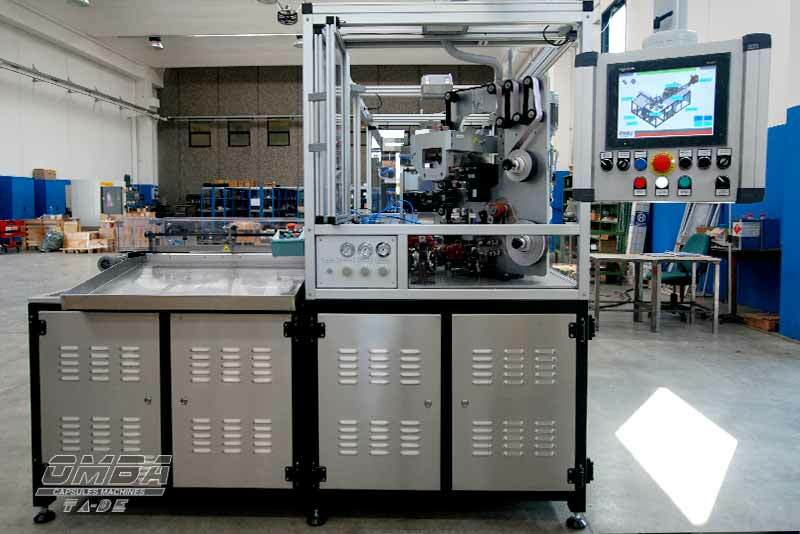 Enological capsule machines with the maximum reduction of vibrations thanks to the solid chassis that increases the resistance to mechanical stress. 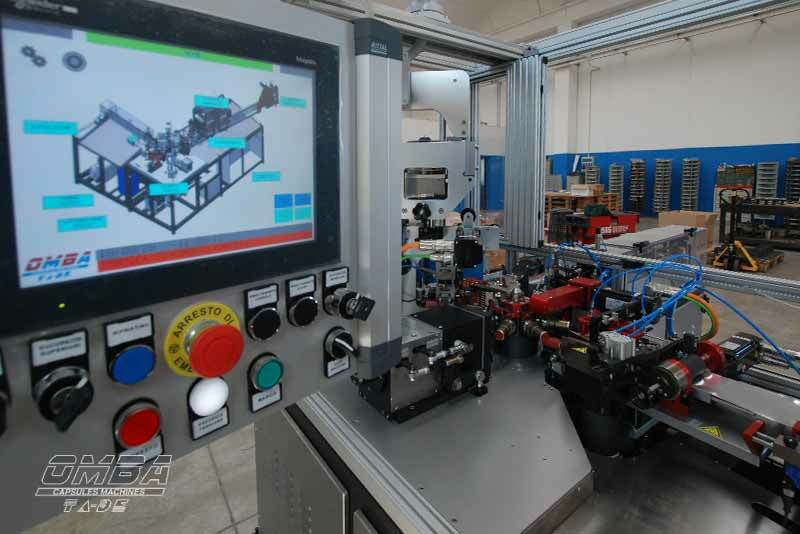 We design, produce and assemble our parts, guaranteeing a complete knowledge of our wine capsule machines. 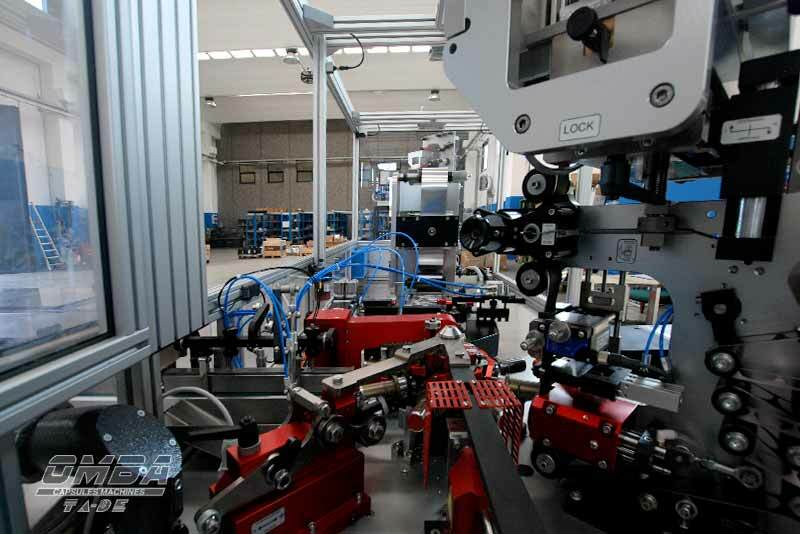 Our technical office invites you to discover our consolidated experience in the world of machine construction and production of parts. 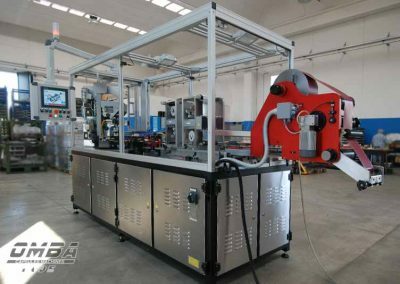 Whit OMBA TA-DE you will have a single interlocutor for engineering, design and production. 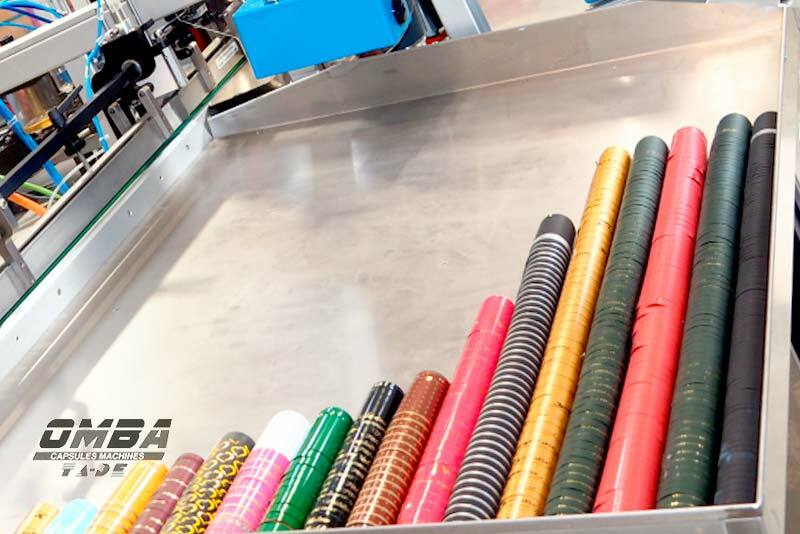 We offer our customers a wide range of production: welding, turning, drilling, milling and grinding. To get more information, get in touch with us. 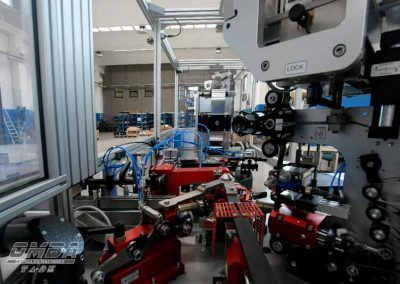 Integrating to the base units some additional units we obtain 3 different machine configurations with different functionalities depending on the installed unit: ROTOMATIC for the production of PVC capsules, POLIMATIC and ROTOPOLIMATIC for the production of PVC and polylam capsules. 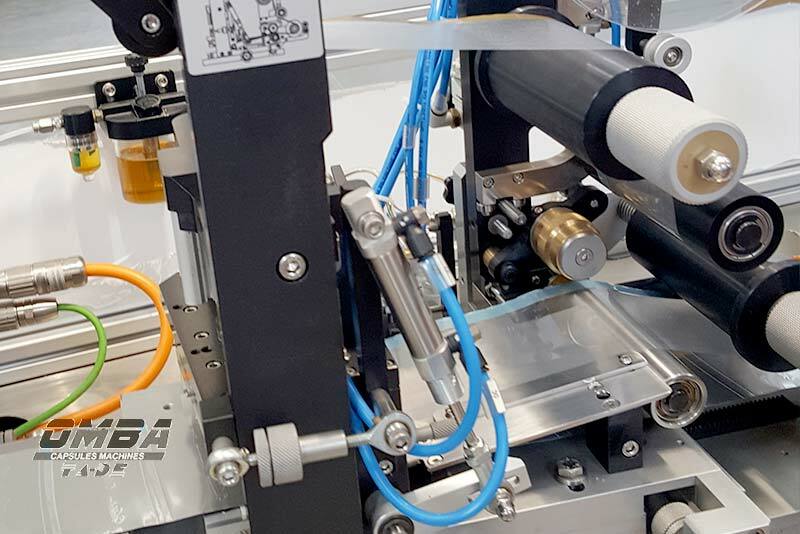 ROTOMATIC – Wine Capsule Machineor for the production of transversal heat-shrink PVC capsules with self-sealing top disc with crescent-shaped perforation and embossing. 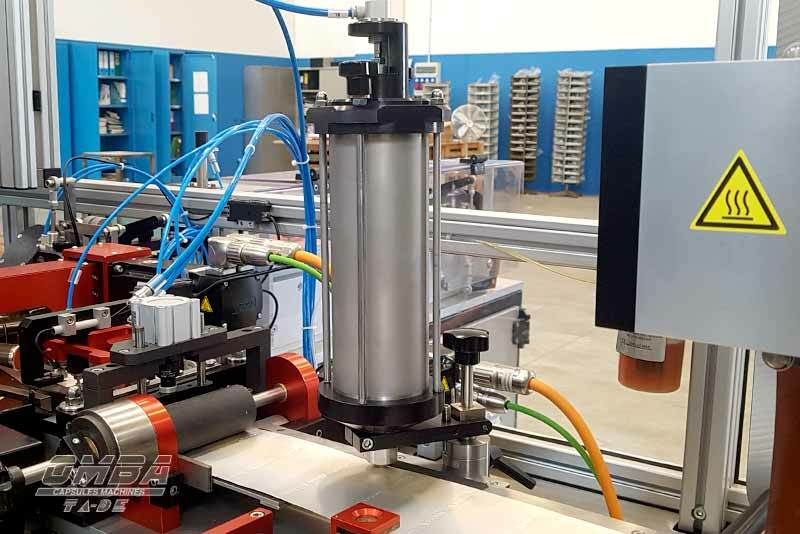 POLIMATIC – Wine Capsule Machine for the production of polylam capsules, designed to develop high quality aluminum polylaminate capsules with hot-welded end discs. 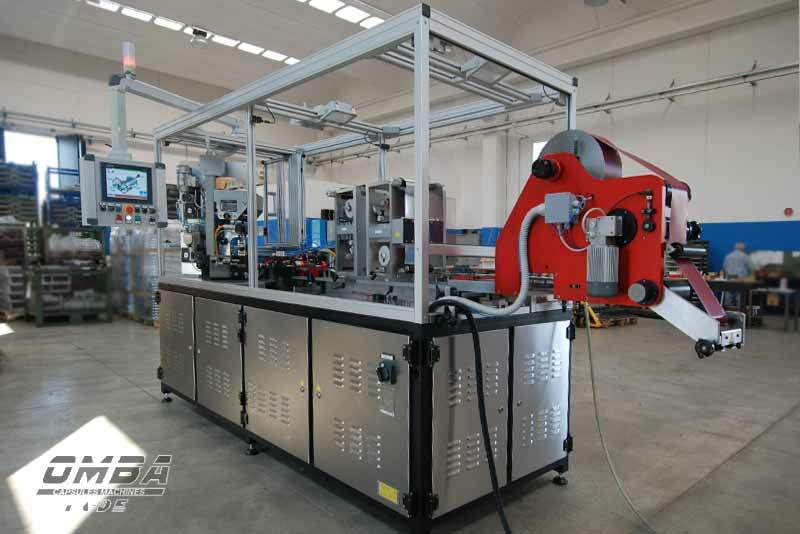 ROTOPOLIMATIC – Wine Capsule Machine for the production of PVC and polylam capsules. 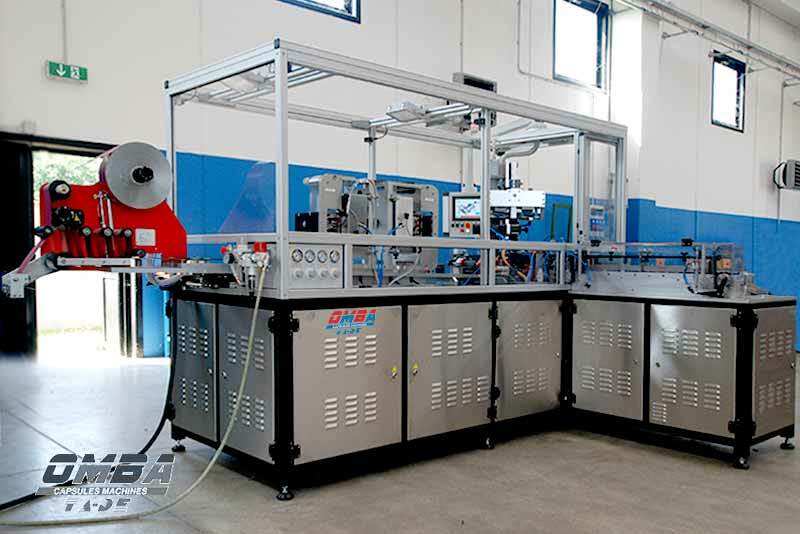 Rotopolimatic is a machine for the production of wine capsules designed to develop high-quality polylam capsules with hot-sealed top disc and PVC capsules. THE RETRACTION is carried out by means of a hot air flow that is conveyed to the capsule or expelled outside when the capsule is not in position. 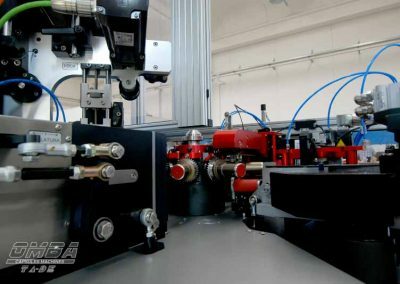 The air temperature can be adjusted to optimize the heat-shrink process. 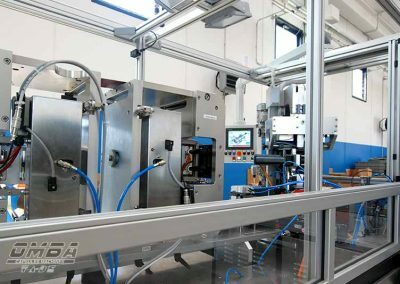 THE ROLLER UNIT is an indispensable unit to create polylam capsules. 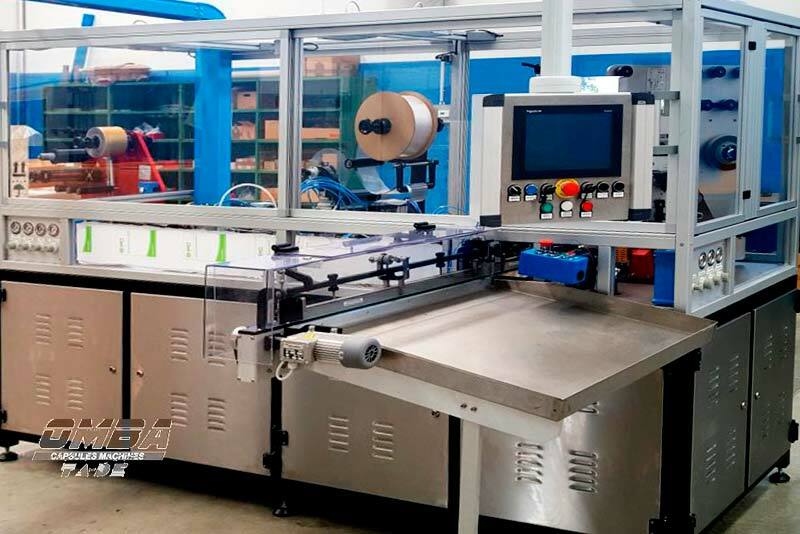 It is equipped with a motor and a mechanical unit in which there are four rollers that rotate around the capsule and calibrate the diameter on the spindles. 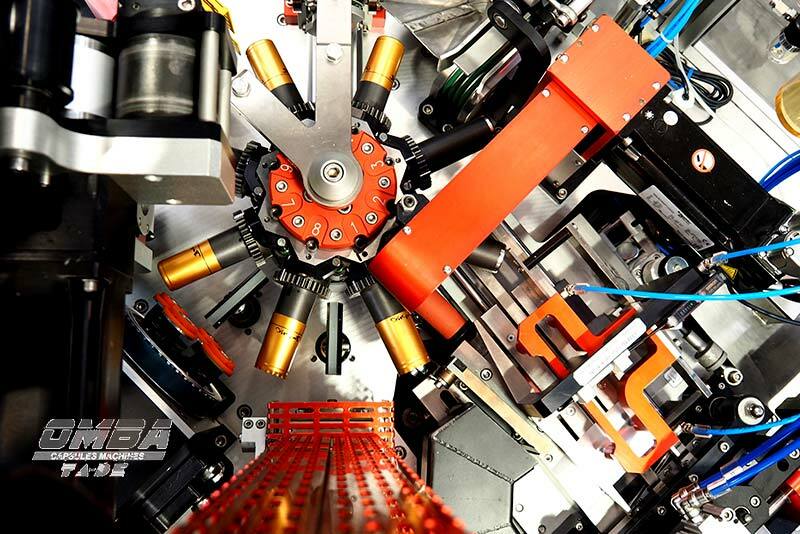 The axial movement and the rolling of the capsule is obtained by means of two mechanical cams in phase with the production cycle. THE EMBOSSING allows you to emboss a series of raised signs. The impressions created allow the capsules to distance themselves from each other when they are collected in units. It is possible to adjust the depth of the impressions and their position in the lower part of the capsule. 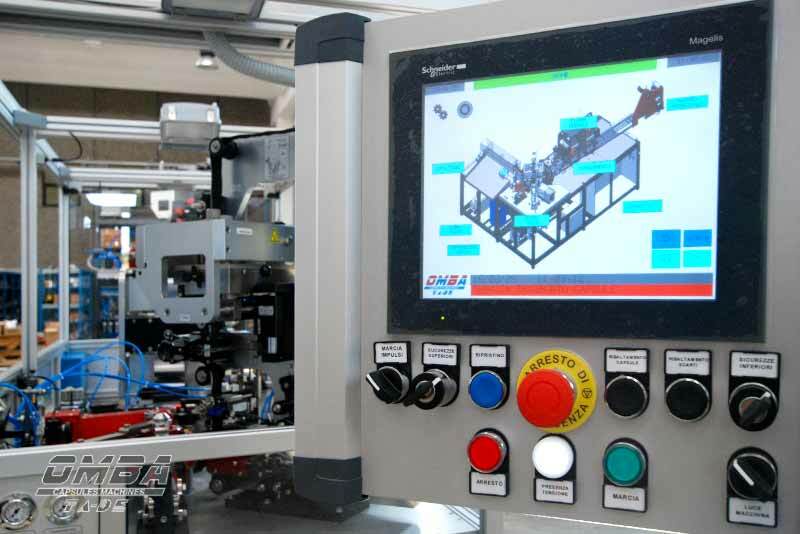 Our machine consists of a series of basic units listed in the table below with different features which are briefly described below: Casing,Top disc blanking, Pneumatic system, Glueing pressing units, Main band unwinder, Operator terminal, Winder, Side cutting, Ribbon transport, Motorization, Spindle head, Mobile plate adjustment, Belt feed, Disc sealing, Electrical system, Ejection, Spindles, Accident prevention guards, Cutter, Side glueing, Embossing. 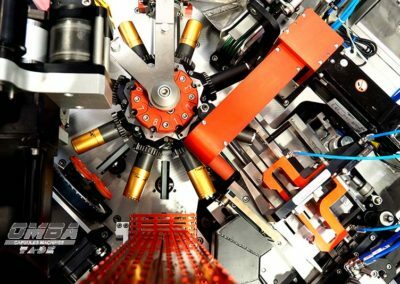 It’s the central part of the machine and is substantially formed by a rotating upper part supporting the spindles and a movable lower part for vacuum or compressed air distribution. 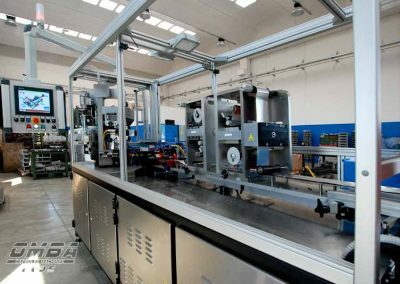 THE MAIN BAND UNWINDER is where the bobbin is placed on a motorized spindle with braking control that extends through some tension rollers regulated by a pneumatically tensioned dancing roller. The PVC and polylam bobbins will have a maximum thickness of 0.75 micron with a minimum width of 105 mm and a maximum width of 140 mm. 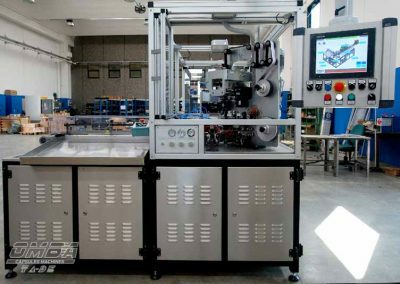 The use of different products is not allowed except with the approval of the manufacturer and the adaptation of the technical features of the machine for the processing of these products. Consists in embossing the top disc by means of a cliché with cam mechanical movement. 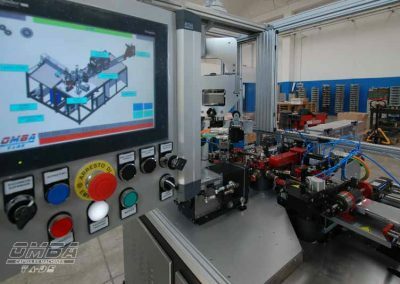 THE MAIN BAND FEED is carried out by means of rollers controlled by an electronic drive that can be adjusted on the machine. 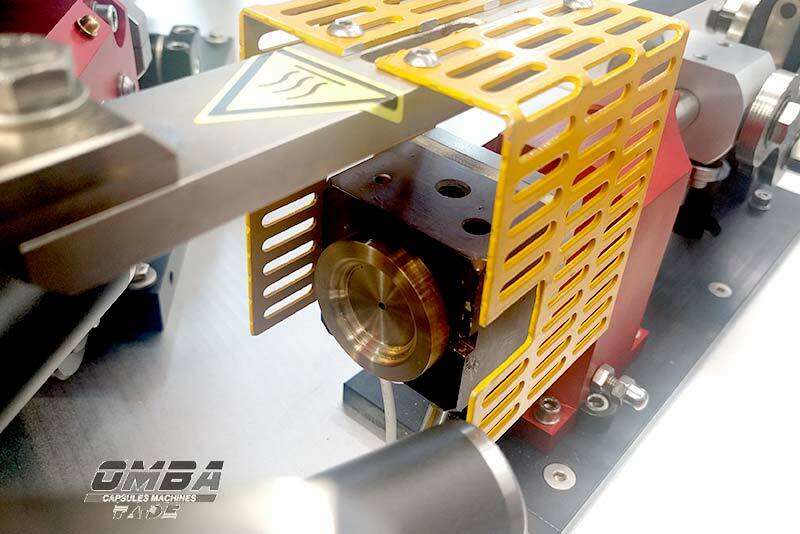 If the material is printed, a photoelectric sensor is enabled, which determines the correct pitch. THE CUTTER is where the sheet is cut by means of a movable and a fixed blade, having a radius suitable for the taper of the capsule to be made. 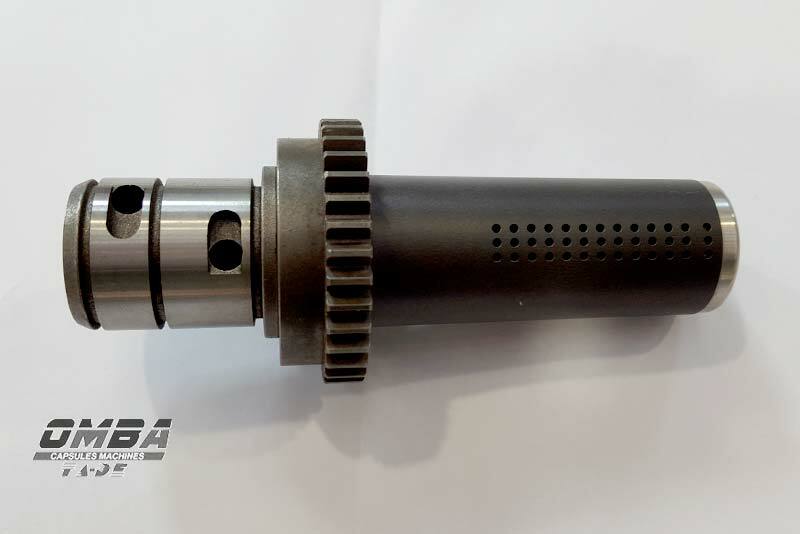 The lower blade is fixed on an axially adjustable plate. 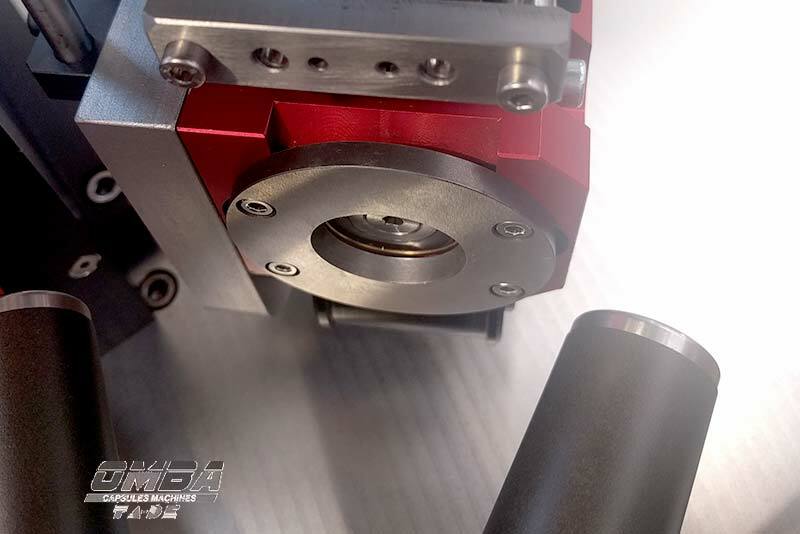 The upper blade, connected to two columns guided by precision axial sliding bushes, placed on the base plate, determines the cutting of the piece by means of a cam movement. This unit leaves the glue on the main band. 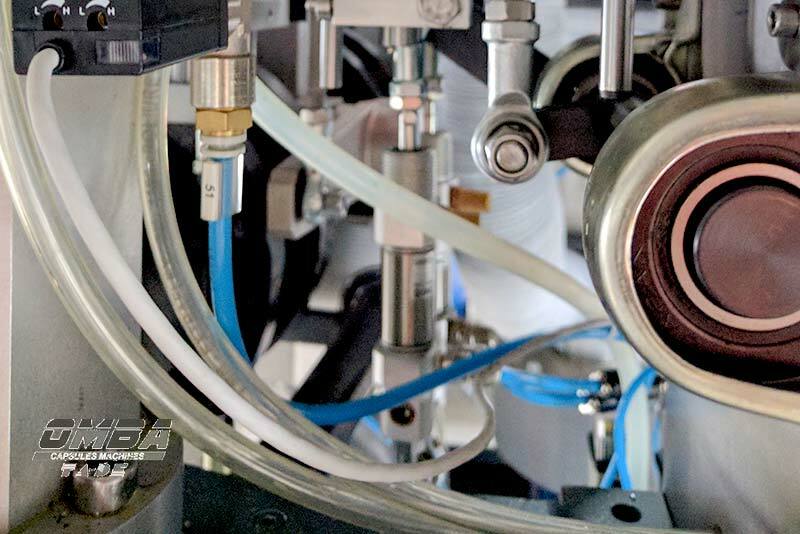 A pneumatic syringe allows the glue dosage by means of an adjustable pressurization tank. 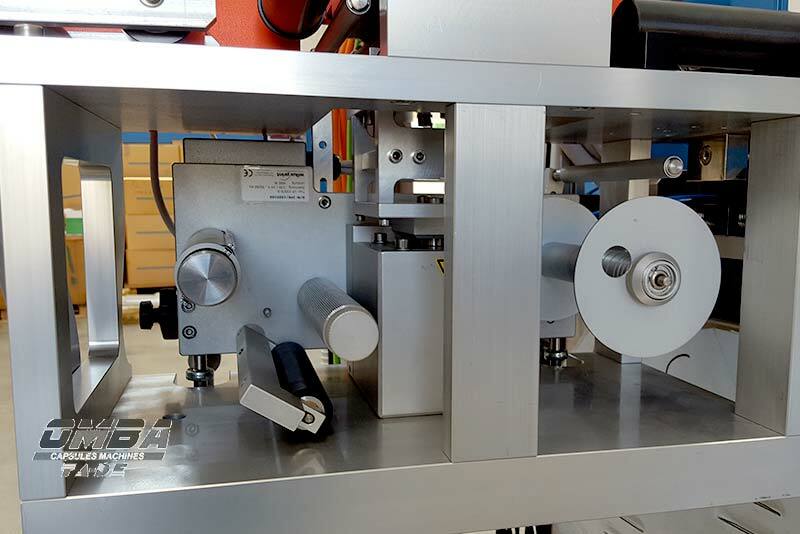 The glue flow is controlled by the belt feed motor, preventing the glue supply under the syringe nozzle when the belt does not run. It’s carried out by means of a bobbin that is mounted on a suitable adjustable support. The disc belt is unwound through a path between tension and fixed rollers, allowing the belt to be aligned and tensioned correctly. Then the belt is punched by two punches which perform a crescent-shaped perforation. On which the blanking die is mounted, forms the blanking unit of the disc. The disc, once blanked, is put on the spindle head. The pre-cut belt waste is wound on a recovery bobbin spindle. 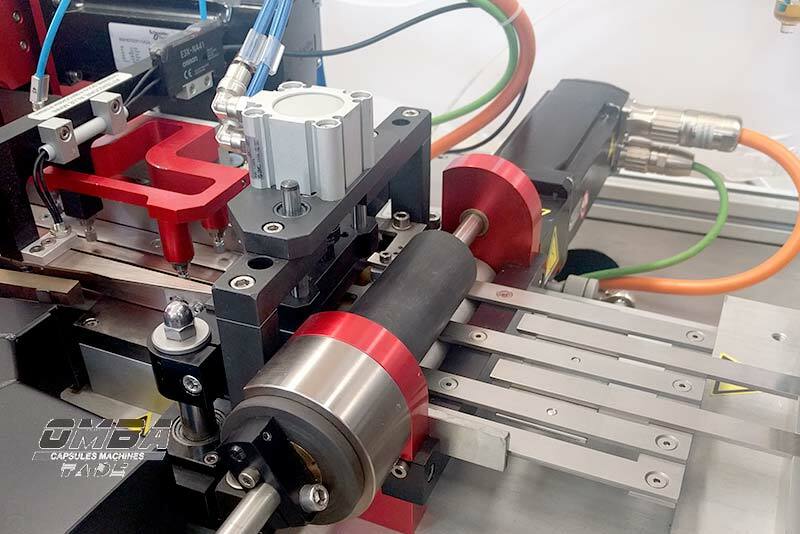 THE TOP DISC HOT SEALING is carried out by means of a block with a raised matrix that goes into contact with the top disc by sealing it to the preformed capsule. The temperature is adjustable and controlled by the control panel located on the side of the operator. It’s the last phase of the production cycle. 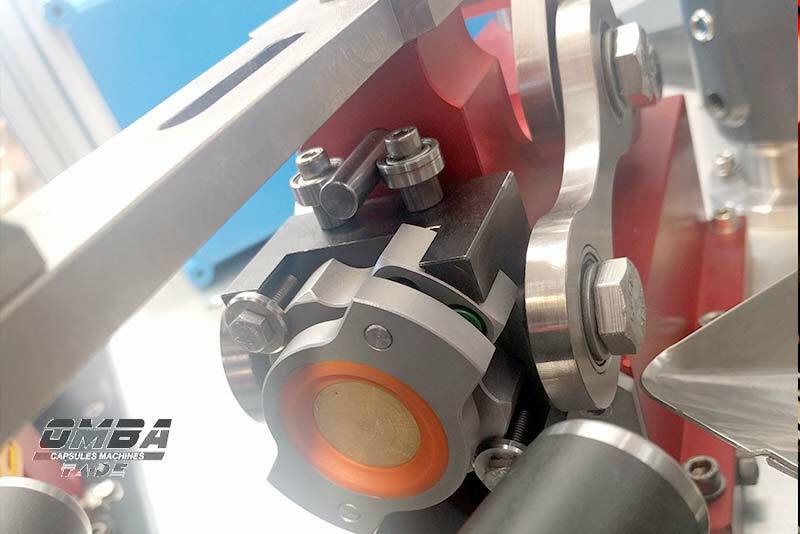 The finished capsules are automatically separated from the spindle by a blow of compressed air (the pressure of the ejection blow is adjustable). The capsules separated from the spindle are intercepted by a photocell that counts the capsules. 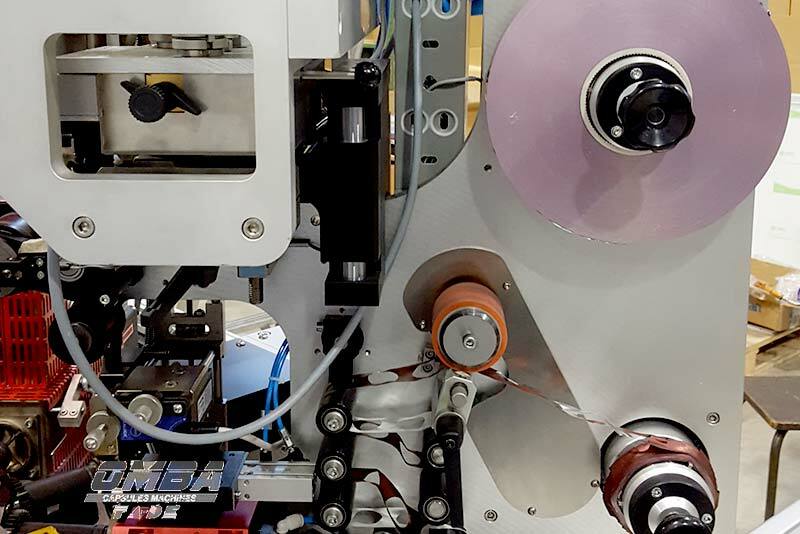 The capsules are directed into a guide by means of a moving belt and a rotating roller, favouring the insertion in predetermined units of pre-arranged quantity. 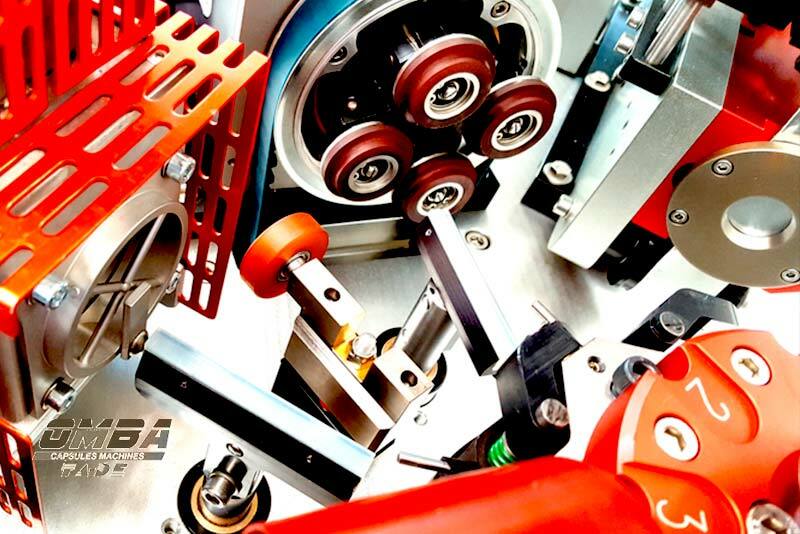 If the capsules jam or are not ejected, the machine stops. When the programmed unit is turned over, a stop device, which is placed on the belt, hinders the path of the capsules until they are turned over in the collection basin. 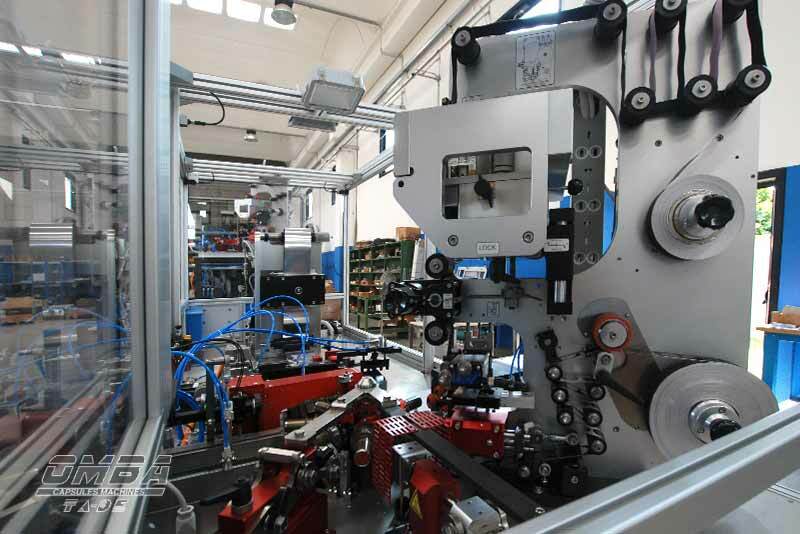 Once the capsules have been turned over, the device automatically returns to its initial position and the stop device is then opened. 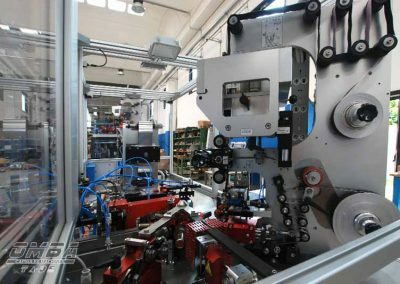 Our wine capsule machines can be supplied with the following options: Rotating spindles, Back Hot stamping, Disc Hot stamping, Strip. Perforetor, Disk Check. 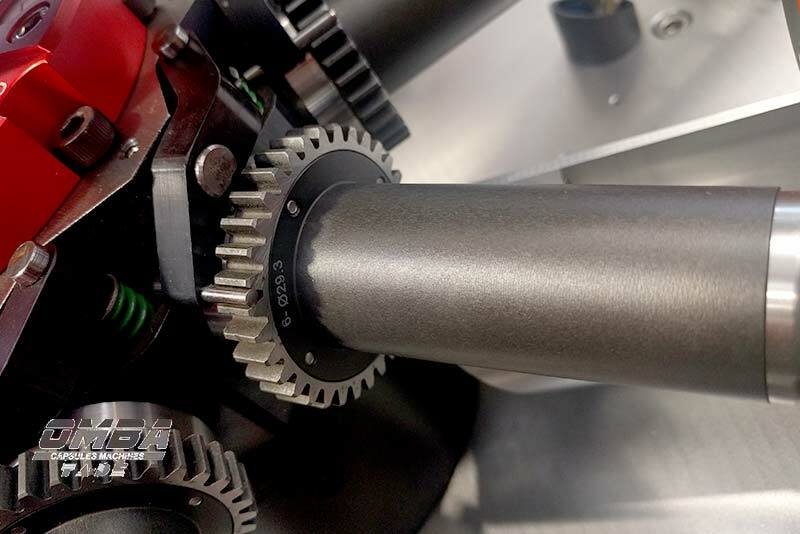 THE ROTATING SPINDLES are indispensable if you want to manufacture capsules with different diameters. 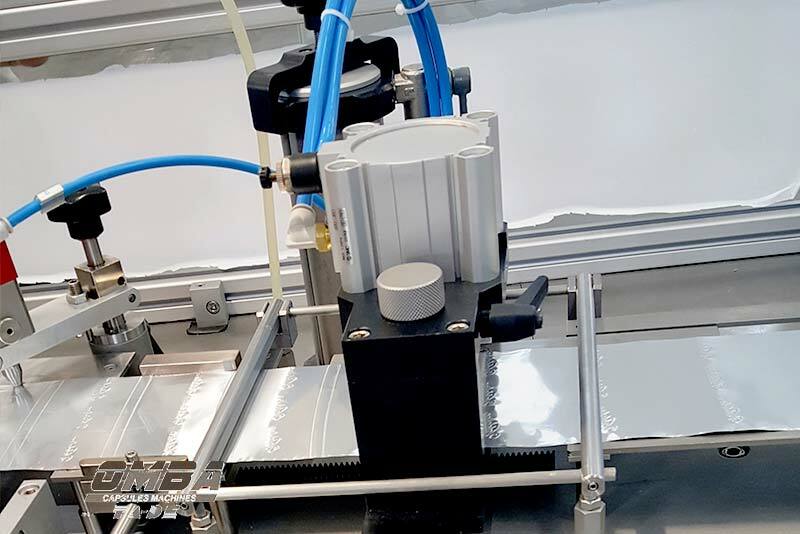 It’s an equipment to be mounted on the disc blanking unit which allows imprinting, by means of thermal transfer, a logo on the band designed to blank the capsule top disc. 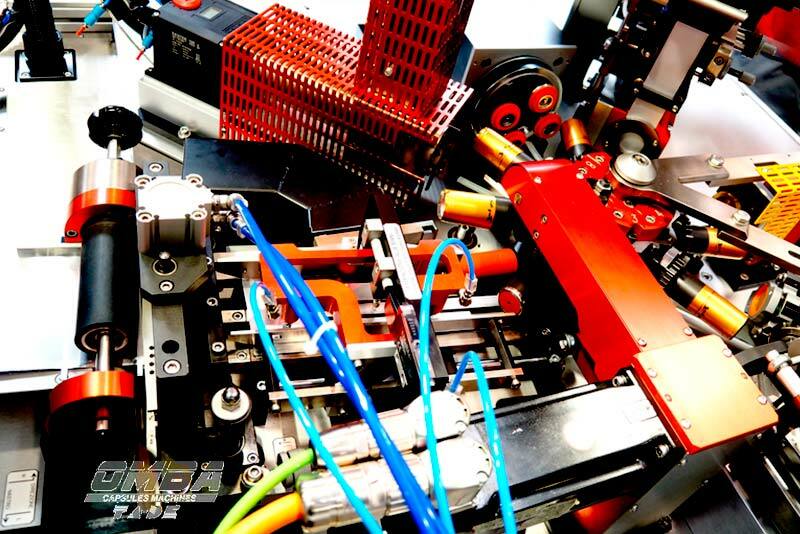 A hot stamping is performed creating a personalized decoration. 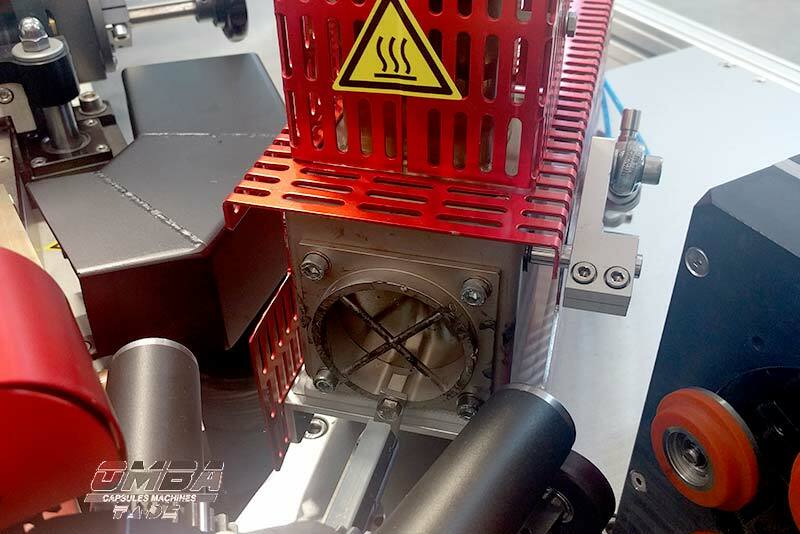 It’s an equipment to be mounted on the disc blanking unit that allows imprinting, by means of thermal transfer, a logo on the band designed to blank the capsule top disc. A hot stamping is performed creating a personalized decoration. STRIP is a tear tab that allows an easier opening of the capsule. A self-sealing PVC bobbin and an aluminium bobbin are inserted and coupled by means of a heated wheel. 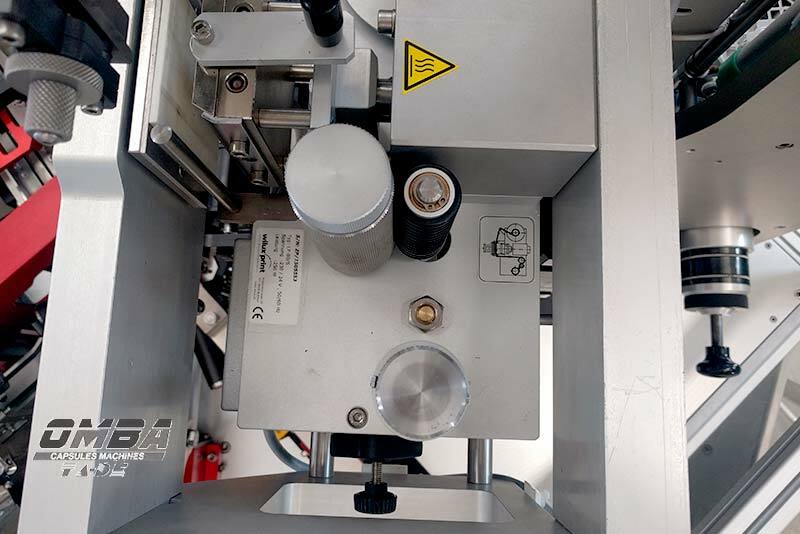 A pneumatic device, equipped with two blades, cuts the side of the strips, so that the upper part of the capsule can be removed when the capsule is finished. The width of the tab to be made is adjustable. 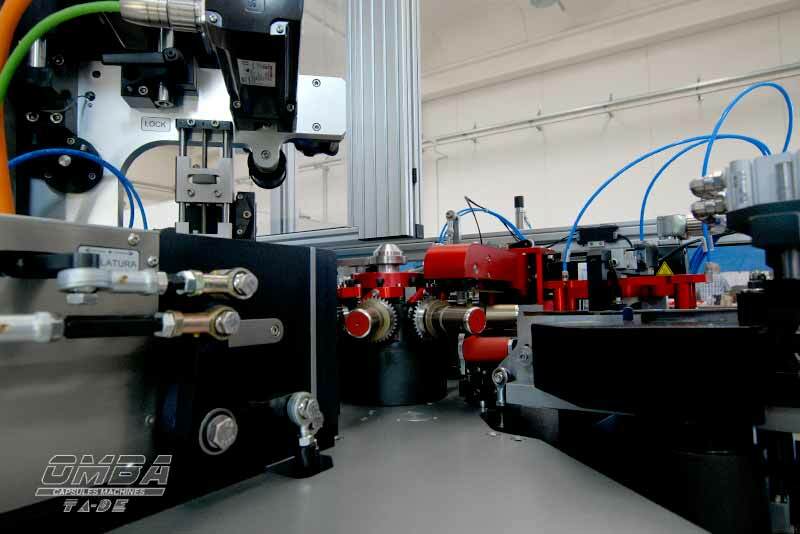 It’s a pneumatic unit that creates a perforation facilitating the tearing of the upper part of the capsule. It’s a device. It is a pre-stamped top disc check. 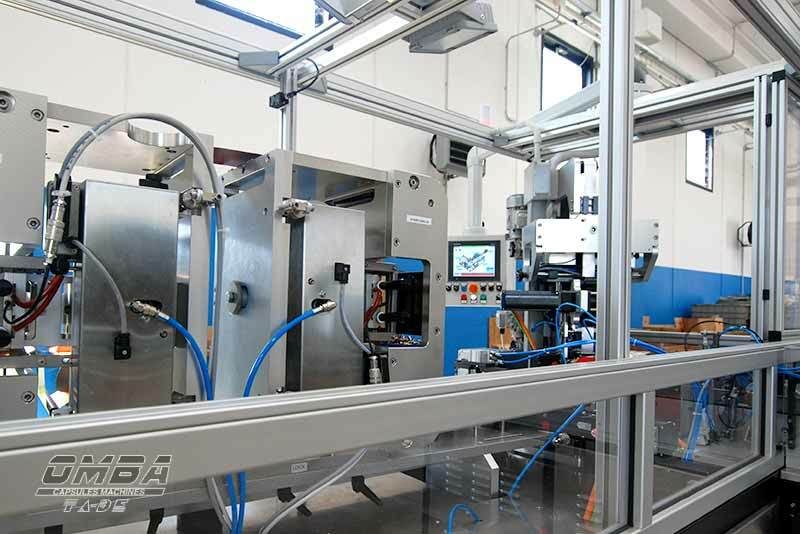 Omba builds: machines for production of wine capsules, wine capsule production machines, capsule production machines, machines for the production of capsule capsules, wine capsule production machines, wine capsule production machines, wine capsule machines, oenological machines, capping machines, oenological capsule machines, capsule machines production wine, production of aluminum capsules, pvc machine production, polymatic, rotomatic, wine capsule machines, oenological capsule machines, wine capsule machine, heat shrink capsules, polylaminate aluminum capsules, polylaminate capsules. capitale sociale € 98.000,00 i.v.